Set up a pan of simmering water, suitable for your mixing bowl to sit on. Make up 400ml of the cordial, you could also use other cordials Belvoirs Elderflower and Rose or Raspberry and Rose are great substitutes, Fresh orange juice for a St Clements…whatever takes your fancy and floats your boat! I tend to cut up leaf gelatine into smaller pieces and place into a heatproof bowl, add enough of your prepared cordial/juice and put to one side to soften, about 8-10 minutes. Once softened put the bowl on top of simmering pan and stir until the gelatine has melted completely. Now add the rest of your cordial stir and then pour the contents of the bowl through a fine sieve into a measuring jug. Slowly pour the unset jelly in. Oven at 170c or equivalent. and take the short out of shortbread! Now, pour the posset through a fine sieve onto your set jellies, do this slowly to avoid bubbles on the posset surface, it’s not crucial…after all it gives us the excuse to hide the ‘bubbles’ with creme chantilly and other lovely stuff! Whip up some creme chantilly (see Pavlova recipe) and pipe some on top of the possets, add a few chopped pieces of Pistachio or Lemon Turkish Delight and a chocolate pencil….toasted almonds sprinkled over…lovely stuff. You could dip the shortbread in melted dark chocolate and leave to set, the bitterness of the chocolate a great match for the lemon hit of the posset. We do lots of versions of this dessert in a glass, sometimes we’ll put a winter berry compote in the bottom, then a layer of posset, once that sets ,a layer of coulis and posset…the coulis bleeds into the posset before it sets, lovely….top with crushed nut brittle. 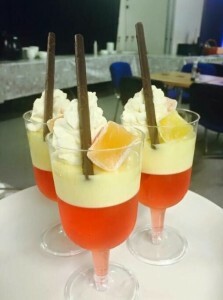 Try other flavours of jelly and posset, I’ve done liquorice versions topped with mini pontefract cakes. Langues de Chat (cats tongue biscuits) can replace the shortbread, either make them or buy them in. Short on time? Buy ready to make jelly, just add fruit for that homemade look. Alcholic version? Make a jelly of your favourite tipple and top it with a tiny layer of posset….vodka and lemon, why not.